Have you bought all new LG Q6 or are in the process of purchasing it? If you have or are then why don’t ensure its protection from these best cases and covers for all new LG Q6? Hope you have already check our suggestions for the best screen protectors of LG Q6. Now with this article, we have brought you the best collection of the cases and covers for the LG Q6. So we highly recommend you to provide your valuable smartphone a 360-degree protection with the best screen protectors as well as the cases and covers of your choice. In this article, you will find nine best screen protector that will secure your phone from the drops falls and scratches. Some of them are also able to provide more than just a protection that is you can carry some essential cards and money with cases. As we care for you, we have picked the best of the cases and covers for your LG Q6 high-end smartphone. This one from LK brand manages to stand out in most of the wallet cases range. This case is capable of replacing your wallet. Well, this LK wallet case has been integrated with three slots to carry essential cards and one sleeve to carry cash, so you don’t have to carry your wallet all the time. 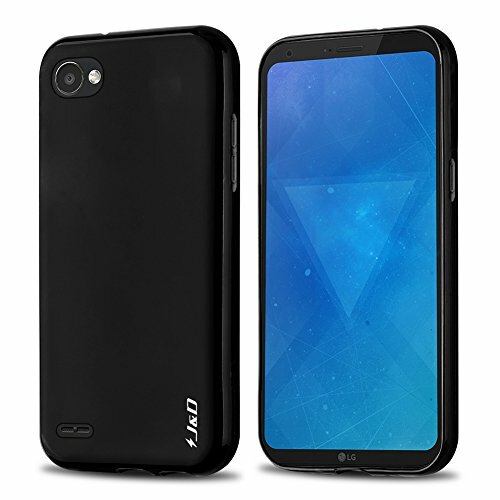 The material which is used in this case is durable PU leather, and the inner shell is made from high-quality soft TPU that offers excellent 360-degrees protection. This case is also a flip case which can be folded and even used as a kickstand for the media consumption needs. Regarding protection, this case also does an excellent job of protecting LG’s new flagship Q6 from the scratches and accidental drops, as it doesn’t expose any part of the smartphone. It is furnished with a magnetic clip that keeps the case closed all the time and provided all-around protection to the phone. It offers precise cutouts for all the functionality of the phone. Durable PU leather and TPU inner shell case. Three card slots and one sleeve. Protection against scratches and accidental drops. The magnetic clip that keeps the case closed and safe. Precise cutouts for all the functionality of the phone. It is an excellent fit. It is spacious as well. There is no need to carry a wallet. It offers excellent protection as well. The case is not equipped with smart functionality like auto sleep and wake mode. It is little bulky too. Lk is one of the famous brands among many leading brands in mobile accessories world. 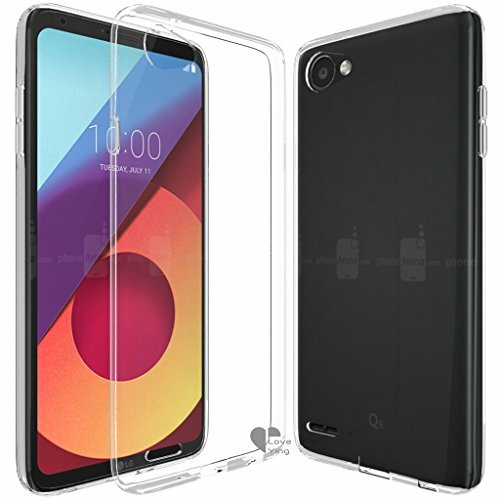 This is the beautiful clear case that is specially made for LG Q6 smartphone only. Because of the gel skin, it will never let you slip off your phone from your hands. Its exclusive design offers quick access to all the buttons and ports of your smartphone without having any issue. This flexible and sturdy case is constructed from TPU that makes it case scratch resistance. This flexible case from LK will keep the original look and shape of your phone. This case is the ultra-thin case, so there is no worry of any bulk. Moreover, it is available in two different colors Black and clear. Flexible, high-quality, sturdy and smooth TPU made the case. Scratch resistance, shockproof and shatterproof. Ideally compatible with only LG Q6. Easy snap on and snap off the case. Anti-slip design offers extra grip on the surface. The raised lip protects the phone screen while placed face down. The ultra-thin design includes no bulk. It offers ultimate protection from accidental drops and falls. It has a sleek and lightweight design that fits well to the phone. It is shockproof and shatterproof too. There is small dotted texture on the back which takes away the glory of the phone. This is the wallet case from one of the most trusted and established brand Tauri. It offers a stylish looking wallet. The case looks extremely well in hands while holding it. 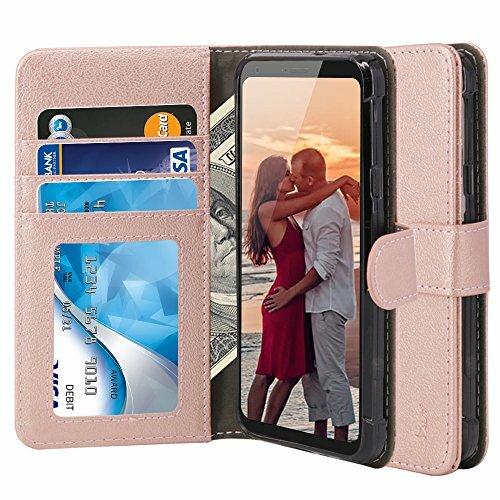 Your LG Q6 will be safe in this premium synthetic leather wallet case. 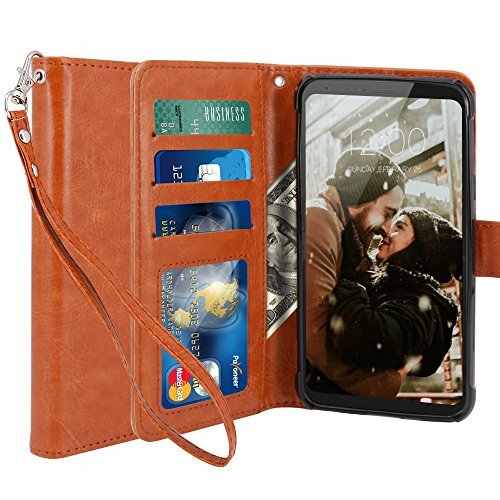 There is also no need to carry any extra purse or clutch while you have this case because this case lets you carry three cards as well as some cash with you. So forget to take a bulky wallet with you while having this case. However this case is available in two different colors Black and Rose Gold, so with the black case you can add professionalism to your smartphone and if you want stylish look then Rose Gold colored case is excellent. The convenient kickstand removes the hassle of yours by letting you chat or watch videos at hands-free convenience. The case offers secure magnetic clip that holds your phone with essentials inside the case safe and secure at all times. Handmade wallet case constructed from synthetic leather. 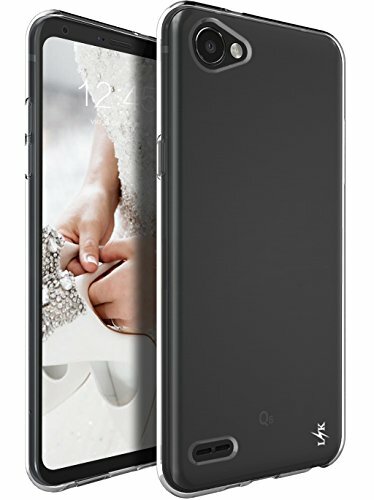 The unique design makes the phone look more professional. Kickstand functionality provides comfortable video viewing, reading, and face time. The magnetic clip keeps everything safe inside. The smooth exterior finishing lets keep the phone away from dirt, dust, and scratches. It is a perfect fit to LG Q6. Carry your phone, credit card, debit card, ID, and cash together. The secure magnetic clip keeps the case closed, safe and secure. Available only in two colors no other color choice. JD offers a slim case that protects the LG Q6 from accidental drops, scratches, and scuffs without include any bulk to the. The case is made from shock resistant protective TPU material. It is not bad enough to excellent protection to the smartphone like LG G6. The case has anti-slip functionality so for those who have butterfingers this case is unique for you. The case covers all corners and edges of the device to provide all-around protection. The case offers easy access openings to all the functions of the phone. Made from shock resistant protective TPU material. Protection against accidental drops, scratches, and scuffs. Provide easy access to all functions. Anti-slip and good handling feelings. It doesn’t add that much bulk to the smartphone. The design and the color of the case add a style factor. It is available in four colors. It protects against only minor drops and shocks. Dual layer cases are quite popular among many of the people just because that those cases can offer dual-layer protection. 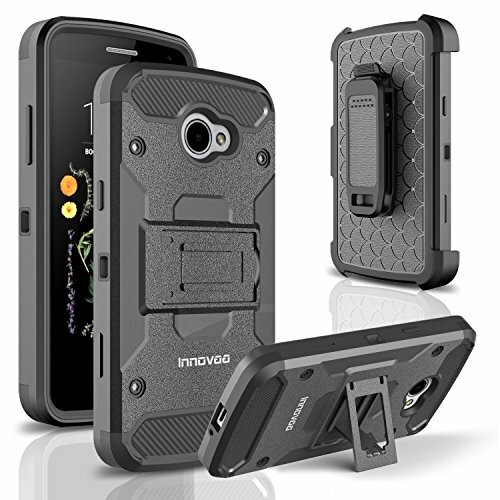 The Innovaa dual layer case is no exception in this regard. The case is furnished with impact resistant exterior as well as doubled enforced inner sleeve that absorbs every single shock. The rugged design of the case is good enough to protect your LG Q6 from scratches, scuffs, and even high drops. The hard holster clip cover can clip on any belt to make your work, travel and play conveniently. The case even has the integrated kickstand for convenient watching movies and other videos on the smartphone. The case offers precise cutouts. Furnished with impact resistant exterior. The inner sleeve is doubled enforced and shock absorbent. Holster cover with belt clip swivel for convenience during work, travel or play. Built in kickstand for hands-free and comfortable viewing angle. Precise cutouts for ports and all button access. Slick Armor design gives full protection. Durable and sturdy dual layer case. Advanced shock absorption for excellent protection. Glass screen protector friendly case. It doesn’t maintain the sleek profile of the phone. It is bulky as well. Here we have another case from the same brand Tauri. It offers a well-constructed and excellent case for LG Q6. 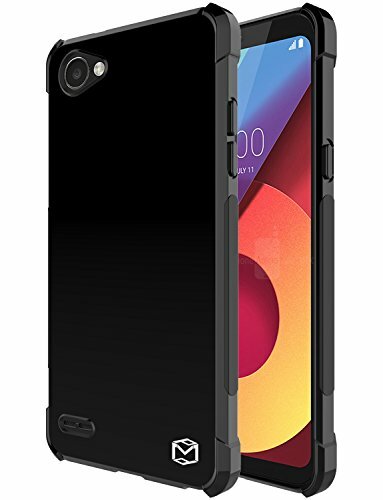 It provides case that is fully compatible with the LG Q6. This case is a slim fit case which means that your phone will never look out of the shape or feel any bulk. This soft and flexible TPU made the case is great at keeping your phone safe from all the harm. The material is also shock absorbent, and scratch resistant protects your LG Q6 from all the bumps and scrapes. It even makes easy to snap on and snap off. The dotted texture inside the case prevents air bubble forming on the back of your phone. It is available in two different black, and clear. Made from a soft and flexible TPU gel. Excellent protection from the daily bumps and scratches. The dotted texture prevents the build-up of air. Scratch resistant and shock absorbent. This durable case made for long-lasting protection. It offers soft, comfortable feel and touch. Protects against sharp object, dirt, and dust. Two color choices black and clear. If you are looking for the funky looking case, this case is not for you because of there is no color range. If you love to maintain the original look of your smartphone, then you must take a look at this case from Love Ying brand. This case offers crystal clear transparency of your phone’s beauty. And we assure that you will certainly fall in love with this case. Yes, it showcases the bold design of your LG Q6 while not compromising with the protection of your smartphone. The case is precisely designed for the LG Q6, and it is made from the flexible TPU Gel Rubber material. This case is good enough to give protection against minor shock and drops. It even ensures that your device remains protected from the scuffs and scratches. The case able to wrap around the whole handset so basically it offers all-round protection with the raised lip. It has precise cutouts for easy access to all the buttons and ports of your LG Q6. Specially made for LG Q6. Made from flexible TPU Gel Rubber material. Protects phone from scratches, damages, dust, and dirt. Easy and full access to ports and buttons. Raised lip offers screen protection as well. It has a super-slim design. It is a perfect fit to the LG Q6. That adds minimal bulk to your phone. It also gets yellowing once you start using it. MP-MALL offers a slim-thin case that brings slim thin but protective case for LG Q6 smartphone. This case provides durable protection as is built with a scratch resistant and shock absorbent gel TPU material that protects the phone from all the bumps and scratches. This case is designed with lightweight, slim and modern profile. The design of this case adds minimal bulk. The case even has slightly raised edges that protect the phone screen when the phone is placed face down. It is an easy install and remove with snap on and snap off functionality. The dotted texture design inside the case maintains the phones form and prevents air bubble. Made from shock absorbent and scratch resistant gel TPU material. Protection from bumps and scratches. It is super slim with the slim and modern look. Raised edges protect the screen from scratches. Dotted texture design prevents air bubbles. It also protects the screen while the phone is placed face down. It offers corner protection as well. The black color of the case provides a professional look. It is effortless to install and clean too. There are only two color options. 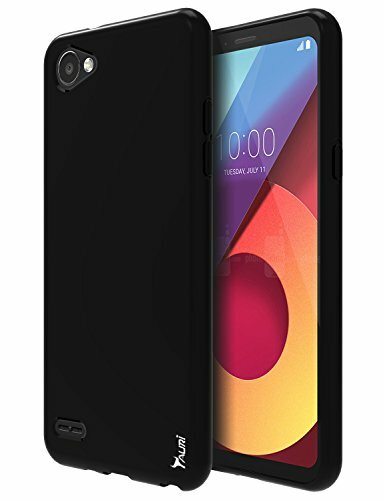 If you have decided to purchase LG Q6 or already have bought then make you provide excellent protection to your valuable smartphone with this best LG Q6 cases. These are some of the best options for you. Hope you have liked our suggested collection of best cases and covers of LG Q6. Do let us know your feedback on this here in the comments.